Ibrox Noise: Is this change at Ibrox such a bad idea? Is this change at Ibrox such a bad idea? If there is one area we have to applaud Pedro Caixinha in, it is the general willingness to use youth, even if it is not as regular as we would like. This afternoon we saw the second fine display in a row from young defender Ross McCrorie who managed to impress more in the 100 minutes or so he has played than the senior he has replaced has managed to all season. McCrorie is an exceptional talent, a solid, stronger than he looks stopper with decent reading of the game. The few errors he made today were entirely based on experience, because based on pure ability, Ross McCrorie is every inch as good as any defender at the club already, having only played a match and a bit. It is plain obvious to most fans that the lad is first team material already, and absolutely justifies the ‘good enough old enough’ cliché we hear all the time. He reminds yours truly of the way Danny Wilson burst onto the scene – the lad was magnificent back alongside Carlos Cuellar and losing him not only devastated us but probably ruined his career. But a comment on the site got us thinking about another youngster who broke through last season and impressed everyone before disappearing entirely back into the Academy system. Jamie Barjonas was briefly linked as a makeweight for the Graham Dorrans transfer, and the outcry from fans who were borderline willing to let the deal with Norwich fail as long as Rangers held onto young Barjonas shows just how much the midfielder eased into the role with such fluidity during his cameos last season. He looked, like McCrorie, well beyond his years, and completely looked the part within the first team at Ibrox. The point of all this? It seems to yours truly that Rangers’ budget is not going to ever allow us to compete toe to toe with Celtic – we might be able to acquire a few players who could be considered marquee but the rest are ‘hit and hope’ – Carlos Pena is one such player who has been a monumental disappointment and thus far waste of money. One or two others have failed to impress too, and it makes us really think that giving the cream of the youth a real chance this season to grow alongside the best of the senior crop would be a better direction forward than just signing more and more patchwork jobs which may or may not work out. While Eduardo Herrera has flirted with improvement the past few games, he and Pena cost together somewhere between £3.5M and £5M, and the return has been measly so far. Meanwhile Bruno Alves simply has not delivered either despite the fanfare over his arrival. Would it be such a damn awful thing to give more young players a real run in the team in the place of these guys? What would be so bad about just making players like McCrorie, Aidan Wilson, Jamie Barjonas et al fixtures in the first team and playing them more often than not? Our ambitions this season have to be finishing at least third, and we see little harm in deploying high quality youngsters. Even Alfredo Morelos, while not one of our own crop, has shown what a revelation he is, and aged only two years older than McCrorie is just as impressive. And has absolutely nailed down that first team place. There is no reason Pedro cannot trust the Academy’s finest and shake up the first team; build around the best he has signed and the best Graeme Murty has, and see where that gets us. Not the worst idea, surely? I want players willing to run through a brick wall for this club. The lack of passion for the badge is appalling. If I saw that muppet Griffiths wiping his snot on the corner flag and disrespecting the club crest I would be punching him fair square in the mouth and bugger the consequences. That's called pride. Where's the meaty challenges, the pressure, the in your face attitude. Give me 11 Ally McCoists any day - real men who defend the honour of the club. If youth players learning to love the club and willing to fight for the cause is the answer, then bring it on!!! Spot on Colin, the likes of a grif--'thumb-heid' SHOULD be too scared to even think let alone DO what he did , the bit of filth that he is. I agree 100%. Barjonas was outstanding last back end and deserved promotion to the first team. I would add one other point on today's showing - why was Jason Holt left on the bench and Pena allowed on the field. He is about two yards slower than Kranjcar. Mccorrie out of his depth got away with a pen in ist half was at fault for 2nd goal easily turned maybe even the ist goal so not ready? McCrorie played very well under the circumstances. He handled Griffiths well, the only time he didn't we lost the second goal, but have a look at Foderingham before you place the fault 100% on Ross. Of course he I said out of his depth, as is the whole team. If you are a genuine Rangers fan you would realise no Rangers player would get into the scumbags squad and that is something we have to get used to in the meantime. The article was not so much about him anyway, it is about Jamie Barjonas and I do agree we need to get these younger lads into the team, but at what cost? We need to get ourselves, using the whole squad , winning games whoever the manager selects and in the current injury crisis these younger players will emerge and establish themselves into the team. We have to back the players, even though we might not agree with the managers team selection or set-up or style of play. I have no idea as to who you are but you are talking rubbish ! McCrorie played well all things considered AND made dumbelly look just this, when he should and probably was, a tad tired at that time in the game.....he made Him look dumb by matching his runs and tackling at the appropriate moment. I reckon young Barjonas would have been a Lot better than Pena , today anyway...Holt too. Agreed we need the energy and ambition young players would bring to the team maybe Mr Murty can transition with them to the manager job too and let Pedro take over the youth team now that would be a move a lot of us would support. hav regularly watched McCrorie, Barjonas Dallas and the fast and skillful winger Atakayi all very good these 4 along with Rudden and the exceptional Burt (injured long term) all deserve a chance as starting in first team in front of a few world beaters brought in by the breadman and Pedro. 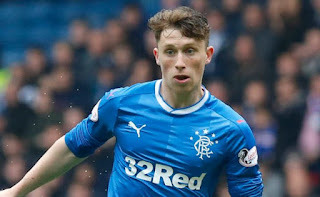 So its time to do it now get another one of these promising youngsters on the park now!, McCrorie has showed he is class and will improve with every game and PLAY for the jersey!! You cant just flick a switch and fill your team of youngsters, our time for that was 5 years ago and like everything else about our club, we missed that boat. I'm talking about playing for the jersey, there are a few empty jerseys in our team punters who have had 'experience' well I would rather play someone who gives everything for the strip than some of the "quality" imports that have arrived and disappear in games. Not talking about flooding team with youth but McCrorie did get pass marks yesterday so why not introduce another one. Cant be worse than whats being offered by some recent signings. Agree with most of the article, however our ambition this season should not be "at least 3rd" it has to be at least 2nd. Young players are going to be vital to our recovery and McCrorie did great, however I remember guys like Scott Wilson and Bob Malcolm looking like world beaters on their first few games and they never progressed. The foreign lads need time to integrate, half a season at least, to adapt to the pace and physicality. Although he was poor, yesterday was just what Pena needed to help his integration. You can't learn how to play Old Firm games by watching them, you have to play and learn on the job. Later in the season will be the time for youngsters, when they can play in a more settled team. I think the younger players should get a chance but in time. I felt the lads done well yesterday, although we lost the game I think we lost to 2 lucky goals and nothing more. After young Ross display I would also look at a back 3 consisting of Bruno, Cardoso and Ross in some games ie Hamilton, County, Thistle to give the boy game time and build his experience in the game. I would also look at Josh and maybe use him as impact sub until he gets more in the game. Kenny didn't contribute anything to the game I felt yesterday but would persevere with him as impact sub same as Novo when we had him. Get Kenny and Josh running at tired defenders to get the goals late on that we need. Need to remember another thing, our team was NOT 100% first team, they had ALL the players they would normally have and we held them to a 0-2, dont get me wrong I'm not over the moon with the loss but some thought it would be 7+. Did anyone else spot how far out of the legal area the ball was when Griffiths was taking corners from the left, including the one that led to the goal. On the other side, where the lino was he put it right on the line. Piss taker! Some part of the ball must be inside or overhang the quadrant. The corners were legal.